A Vermont Classic- “A Must-Do”. The Maple Leaf Half Marathon traverses truly gorgeous Vermont landscapes. Your run will take you from the downtown community to picturesque village settings to country roads past farm lands back to the finish. Adding to the beauty, Vermont will be in the early stages of fall foliage. The Maple Leaf Half Marathon and Kotler 5K will be run on Saturday, September 7, 2019 in beautiful Manchester, Vermont, a vibrant region with much to offer. Organization is excellent, and the course is scenic and enjoyable. There is something for everyone in this rural Vermont tour. 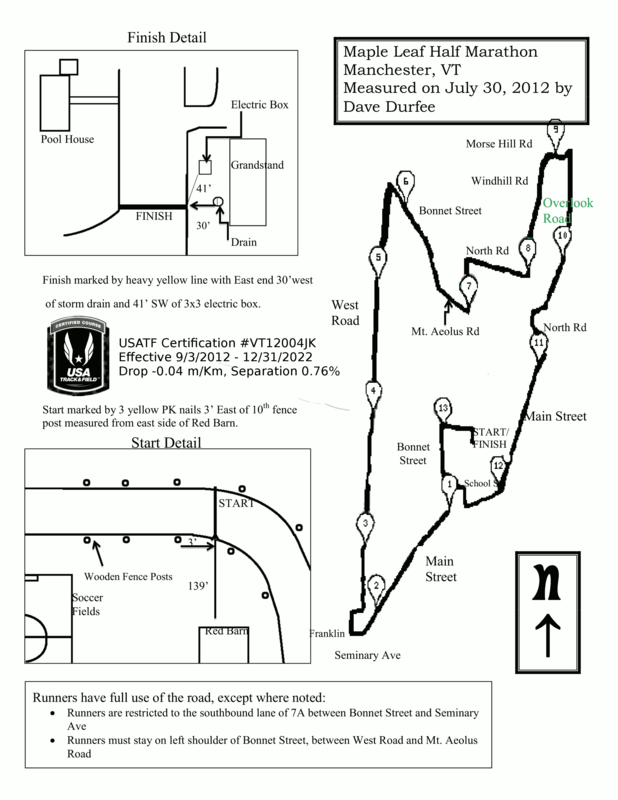 It’s one of those “must do” New England races. Manchester, Vermont is a year-round sports, recreation, foodie and shopping destination in the heart of the Green Mountain National Forest. Reserve your tee shirt before August 1st for best pricing! Shirts will be available on-site for $15 This shirt is an addition to the runners gift of Vermont Maple Syrup and tech hat.